Truck believed to contain dozens of smuggled weapons parts found to contain no less than 354 pieces of weapons meant for reassembly. 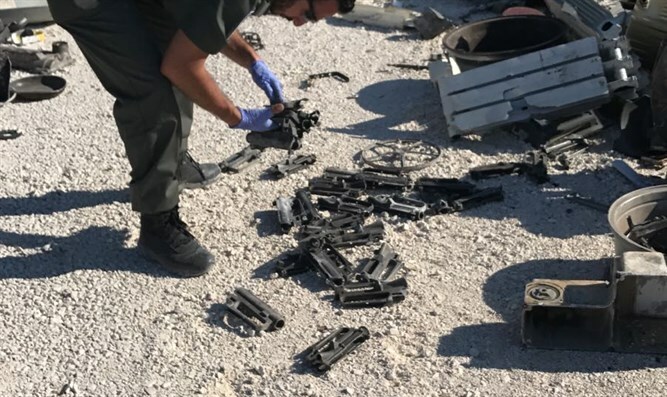 Yesterday, inspectors from the Civil Administration Environmental Protection Unit and the Border Police seized a truck used in an attempt to smuggle many weapons to the Arab village of Idna near Hevron. The inspectors were stunned to discover dozens of parts of weapons, including M-16 assault rifles, in the truck. However, the inspection of the vehicle had to be delayed after sundown, and the precise number of weapons in the truck remained unknown. The search resumed Wednesday, and the inspectors were again shocked to discover that they had vastly underestimated the number of weapons parts in the truck. Whereas the initial reports stated that there were dozens of weapons in the vehicle, it was determined today that the truck contained 354 weapons parts. The police estimate that the pieces were smuggled as part of efforts to manufacture weapons in the Palestinian Authority. Two suspects in the arms smuggling operation were arrested, the driver of the truck and a passenger.